Erysipelas is a bacterial infection in the upper layer of the skin. It is a form of cellulitis, but unlike cellulitis, which affects deeper tissue, both conditions are similar in appearance and are treated in the same way. Erysipelas is usually caused by the beta-haemolytic Group A Streptococcus bacterium, the same bacterium that causes strep throat. Occasional cases caused by streptococci of group C or G are reported in adults. Group b streptococcus is often responsible in the newborn and may be the cause of abdominal or peritoneal erysipelas in postpartum women. 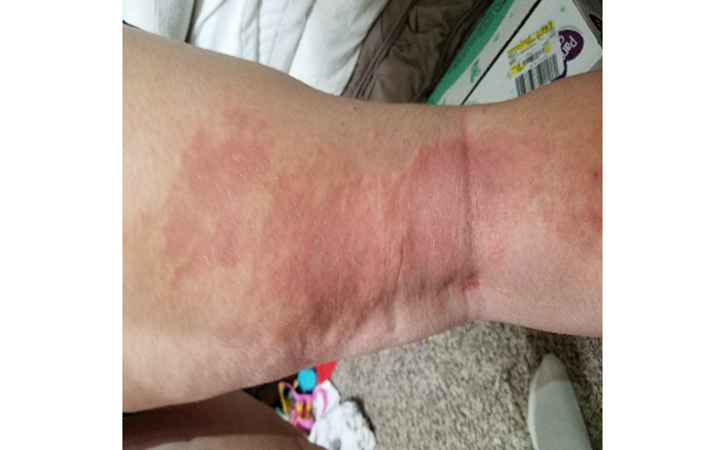 The infection results in large, raised red patches on the skin. This is sometimes accompanied by other symptoms, including blisters, fevers, and chills. Erysipelas most frequently occurs on the face and legs. Erysipelas often improves with treatment. The infection can usually be treated effectively with antibiotics. Anyone can get erysipelas, but it most commonly affects infants and adults over the age of 60. Erysipelas is not hereditary or contagious. Often, a person will feel unwell before visible signs of erysipelas appear on the skin. Symptoms can include fevers, chills, , and. When erysipelas affects the face, the swollen area usually includes the nose and both cheeks. Erysipelas is usually caused by the beta-haemolytic Group A Streptococcus bacterium, the same bacterium that causes strep throat. Occasional cases caused by streptococci of group C or G are reported in adults. Group b streptococcus is often responsible in the newborn and may be the cause of abdominal or peritoneal erysipelas in postpartum women. Erysipelas occurs when beta-haemolytic Group A Streptococcus bacteria penetrate the outer barrier of skin. These bacteria normally live on skin and other surfaces without causing any harm. However, they can enter skin through a cut or a sore and cause an infection. Conditions that cause breaks in the skin, such as athlete’s foot and eczema, can sometimes lead to erysipelas. Erysipelas may also occur when the bacteria spread to nasal passages following an infection in the nose and throat. Some medications can weaken the immune system and lead to erysipelas. These medications include some cancer drugs and medication commonly used after organ transplants. Erysipelas is curable. It is important to start treatment as early as possible to limit the chance of further complications. Most people with erysipelas can be treated at home, but some may require treatment in a hospital. Depending on the severity of your condition, your treatment plan can include home remedies, medication, or surgery. Usually, the affected part of the body must be raised higher than the rest of body to reduce swelling. For example, if leg is affected, should try to rest as much as possible with the leg elevated above hip. Prop up leg on some cushions while lying down. It’s also important to drink plenty of fluids and to get up and walk around from time to time. Leg elevated for several days before the swelling goes away. Pristinamycin and roxithromycin have to be good choices for erysipelas. If facial erysipelas is present or if MRSA is suspected, empiric therapy should be initiated with vancomycin 1 g IV q 12 h (which is active against MRSA). Cold packs and analgesics may relieve local discomfort. Fungal foot infections may be an entry site for infection and may require antifungal treatment to prevent recurrence. Surgery is only required in rare cases of erysipelas that have progressed rapidly and caused healthy tissue to die. A surgical operation may be needed to cut away the dead tissue. When anyone suspect, erysipelas or other bad skin condition, patient must visit a doctor as soon as possible. So, doctor can start treatment early. Besides, appropriate analyze also helpful for patient.